My name is Reza. 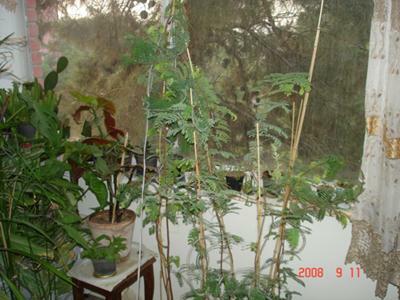 I love gardening, but in apartments I thought only I can keep cactuses- what I do for more than 7 years. it's the first time I'm going to grow a bonsai. I have rised some tamarind last year and now I want to train them as bonsai. as i didn't have much space I have 2 trees in evry vases. I'll be glad if you help me have a nice bonsai. thanks. hi, you should cut down your tree, its too high and not symmetrical on its trunk. apply air layering so that the uppermost part will be useful again. air layering was mentioned in bonsaiforbeginners for your reference. welcome to world of bonsai. Check my work I post some of them here.